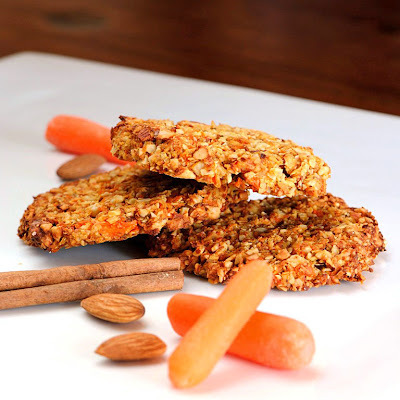 well, first i give many props to SOG-Son of Grok...a fellow blogger that i believe, came up with this interesting recipe for a healthy, satisfying cookie. these really are PRIMAL and definitely something a caveman would and could munch on for a tasty treat. the recipe was so easy, healthy looking and actually so weird...no flour, no butter and no sugar...that it intrigued me enough to run to the market and buy the little stubby mini carrots, dive into the pantry for the rest of the ingredients and make them right away. i'm always looking for something healthy to balance out all the pork fat i've been consuming and this seemed to fit the bill. these are kind of a "what you see is what you get" kind of a cookie. the main ingredients are carrots, almonds, and coconut...no guess work on the flavor profile there, but you'll be surprised how they actually DO taste like a carrot cake...well, the first bite does, then you find yourself munching mainly on almonds and semi raw carrots with a hint of coconut which isn't a bad thing at all...and...no after treat guilt that's for sure. nothin' but good for ya in these chunky little patties. 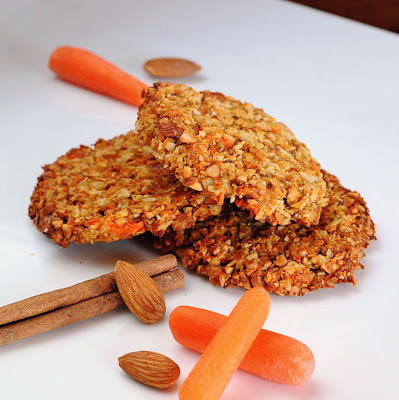 a little warning to the real cookie lovers out there...these are not like any real carrot cake cookie you might expect. think HEALTHY, think RAW, think AGAIN if you're looking for a delicious treat with cream cheese frosting. i just added a few more spices. next time i might play around with a little almond flour, a little more spice, more sweet and maybe grated carrots. 1. Combine all ingredients except eggs in food processor. Pulse until small but a little chunky. use your judgement. i wonder if the carrots should be shredded before going in the processor? 2. Combine mixture with eggs in a large mixing bowl. 3. Form into “patties”. this can be a little messy. just make them like you would a hamburger patty and flatten them. they, of course, WILL NOT RISE. place on a baking sheet. I made 14 with this batch. 4. Bake at 350 degrees until done. Mine took about 40 minutes. Wow, flourless cookies? These do look really healthy and yummy!